I'm staying with my parents this week so I've had time to browse around the house (and my old bedroom) checking out some stuff. It's been a lot of fun looking at yearbooks, pictures and diaries. Since my family has travelled a lot over the years, we have collected some weird items. 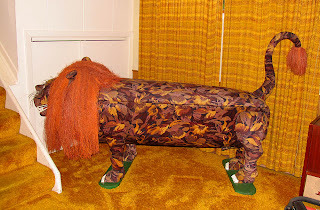 Perhaps the weirdest is a coffin that resides in the lower family room. This was brought back from Ghana by my brother a couple of years ago. In Ghana, caskets are designed to be symbolic of your life. 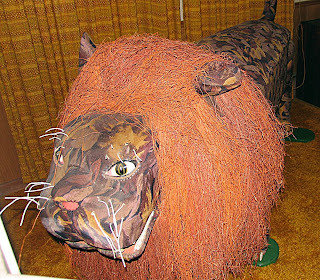 In this case, it is in the shape of a lion so the prospective owner could be a strong hunter or a virile leader. For a while, my brother also had a crab, an airplane, a cow and something that looked like a cougar. The lion is a little on the small side so either Ghanians are quite short or else they are chopped up into pieces so that they can fit. Without a dismembered body inside, it is a great piece of art. 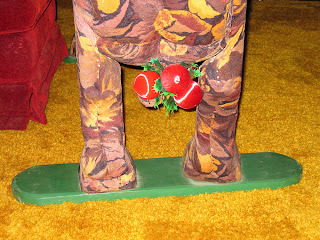 The lion comes complete with testicles which were decorated for Christmas. It is important to be festive.